Located in room S301 of TRU’s Ken Lepin Science building, is the Sleep Centre Clinic. The clinic is the only one in Canada run by students. Second and third-year respiratory therapy students run the clinic, performing administrative tasks, maintaining patient files and diagnosing sleep disorders. The students have found the hands on experience provided by the clinic to be of great benefit to their development as respiratory therapists. “The clinic has been beneficial because we are learning patient interaction, as well as more about obstructive sleep apnea and sleep apnea, which is a huge part of respiratory therapy. We are also developing our assessment skills and our knowledge about people,” said Brittney Lukocs, who helps run the clinic. The Sleep Centre Clinic is a purely diagnostic clinic. The clinic offers free diagnostic testing for people throughout the B.C. Interior. To get an appointment at the sleep clinic, a patient must have a referral. Once a patient has an appointment, they go to the sleep clinic and are provided with diagnostic devices to sleep in that monitor the flow of breath, sleeping position and oxygenation levels. The students at the sleep clinic analyze and interpret the data and send it to the patient’s doctor. 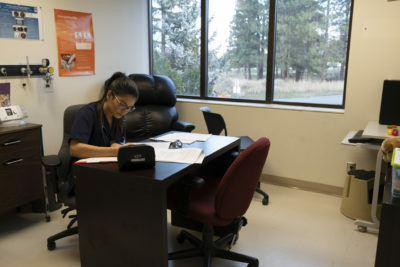 “After a patient has an appointment, it’s usually a week to a week and a half before their doctor gets the results,” said Samantha Ross, another respiratory therapy student at the clinic. The Sleep Clinic partners with VitalAire to provide the patients with treatment. Once a patient is diagnosed with a sleep disorder the clinic refers them to a VitalAire Clinic where they are offered CPAP (continuous positive airway pressure) treatment. The Sleep Centre was started by Les Matthews, an associate professor of respiratory therapy, over twenty years ago. It is now run by Aaron Ladd, a lecturer in the Faculty of Respiratory Therapy. Recently the Sleep Centre Clinic has boosted its capacity and can now take six patient appointments in a day. The Clinic runs from 1:00 – 5:00 p.m., Monday to Thursday.